With its pommel shaped like the head of an eagle, the Brass Finish Roman Eagle Dagger is a remarkable replica weapon based on those used in ancient Rome. Brass and silver finishing lend a sense of regality to this collectible dagger. Made of polished stainless steel, the blade displays a traditional pugio shape. 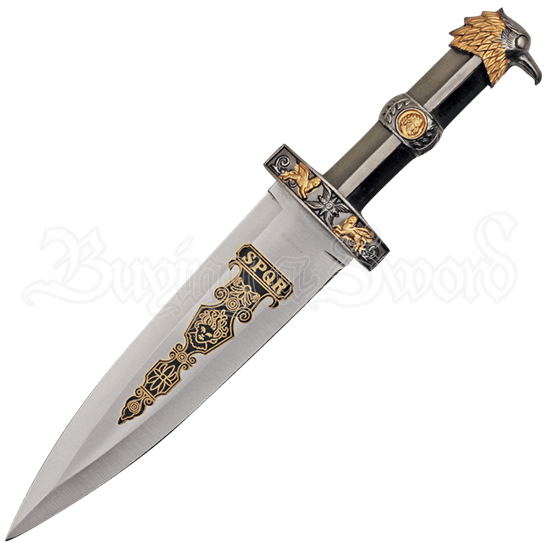 Black and brass tone scrollwork decorates the center of the blade, featuring the head of a woman and the letters SPQR. Winged beasts adorn the short crossguard of the cast metal hilt, and the face of a ruler framed by laurels appears on a band at the center of the bi-sectional grip. The eagle head sits proudly as the pommel of this Roman reenactment dagger, its feathers detailed in brass. A matching cast metal sheath is included, itself decorated with brass tone detail upon its endcap and throat. A circular crest at the throat depicts Romulus and Remus with a wolf. Whether you are interested in the weapons of ancient Rome or love to collect beautiful takes on historical blades, this decorative eagle dagger makes a fantastic display piece, collectible, or Roman reenactment accessory.